Deeply scan all kinds of lost or deleted data on your iPhone, iPad and iPod with the most intelligent data recovery engine. Freely preview scanned data on iOS Device and recover selected items according to your own needs. Data loss can take place for various reasons. No matter what it is, DiskLab for iOS is able to fully recover them from all kinds of reasons like accidental deletion, device lost/ broken/smashed/crashed/locked/reset/jailbroken and even water damaged. There is no need to worry about it, let's face it and fix it with the help of this wonderful iOS data recovery program. Recover all files or items deleted by intentionally or intentionally. Retrieve all kinds of lost data completely due to app or system crashes. Factory reset your iOS Device? Easy to restore the wiped or eased data from reset. Device locked and need to restore it? Fully retrieved lost data after iTunes restore. Empowered with sophisticated data recovery algorithms, Tunesbro DiskLab for iOS is the ideal tool to be used for recovering data from iOS devices due to its advanced features and user-friendly interface. It is only 3 clicks away to completely restore the data. Can't find such a nice product on earth. Support Recovering Files from the Latest iOS Systems and iOS Devices. as well as the latest iOS systems such as iOS 10, iOS 9.3. Decided to go with DiskLab for iOS? OK. Here are four data recovery modes you can choose freely. No backup file found? Then this recovery mode is the best fit. 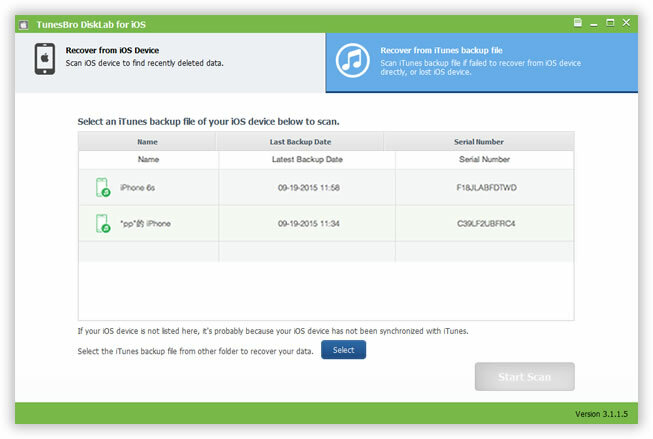 DiskLab for iOS can directly scan lost data on iPhone, iPad or iPod and recover them after scanning. Already backed up your device with iTunes? Good. You can preview and extract lost data from the existing backup file in a less than 3 minutes. Don't know which recover mode fits for you? DiskLab for iOS will make a right decision for you based on intelligent device analysis. Thanks to the redesigned GUI, it is much easier for users to find the recover option suitable for them with the same advanced settings as before. The features are more approachable and the new online help page explains everything in details. "This software does exactly as described and works in a very simple way without any problem. It helped me recover deleted contacts and messages easily from my iPhone 6S Plus. I am a very happy customer. Thank you for this great product." • How to Fix When iPhone Stucks in Recovery Mode?